Over 400 Japanese Army kamikaze pilots departed from Chiran Air Base between March and June 1945 to make attacks on Allied ships near Okinawa. The small town of Chiran, located in the southernmost prefecture of mainland Japan, has become famous for its two museums and other memorials related to kamikaze pilots. 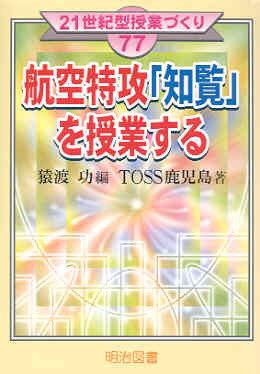 This book by the Kagoshima chapter of the Teacher's Organization of Skill Sharing (TOSS) contains sixteen one-hour lesson plans about Chiran for classes primarily in upper-elementary grades. Sixteen different elementary school teachers in Kagoshima Prefecture, where Chiran is located, wrote the lesson plans included in this book. The authors used these lessons for the curriculum in elementary school ethics or social studies, with one exception being a Japanese language lesson with focus on last letters written by kamikaze pilots. The objectives of the various lessons fall into three main categories: (1) explain basic facts concerning the Pacific War and the kamikaze attacks, (2) tell about young men who gave their lives for their families and country, and (3) describe the love that Tome Torihama, who ran a restaurant in Chiran, showed toward the young men about to depart on suicide attacks. The methods used to teach the classes include showing photos, telling basic facts of kamikaze operations and Japan's war from 1931-45, asking opinion questions, reading short letters written by kamikaze pilots, and having students write their own opinions and feelings. A few teachers also showed excerpts from a video documentary that displays actual footage of kamikaze attacks on Allied ships. Several lesson plans include the question as to whether the kamikaze pilots volunteered, were ordered, or were partially coerced. The students in one sixth-grade class had the following answers: 12 for "volunteered," 14 for "ordered," and 4 for "partially coerced" (p. 137). The teacher explains in the book that cases existed in each of these three categories. Historical photos play a large role in these classes on Chiran's aerial special attacks made by kamikaze pilots. Teachers most frequently use the photo of five smiling pilots with one holding a puppy (see photo on Home Page) in order for students to recognize the pilots' young ages. The lesson plans use this photo to explain that most kamikaze pilots were from 17 to 22 years of age. 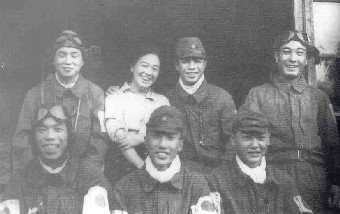 Several teachers also use the photo at left, which shows Tome Torihama smiling together with six kamikaze pilots. These classes on ethics explain that Tome treated the pilots as if they were her own sons when they visited the restaurant she operated in Chiran. Kagoshima Prefecture had several Navy and Army air bases from which kamikaze planes took off to attack ships off Okinawa. As a result, the lessons in this book can successfully be taught as local history to young students in Kagoshima, since some may have visited the Chiran Peace Museum for Kamikaze Pilots or may have some previous knowledge about kamikaze from their family. However, teachers outside of Kagoshima rarely teach these lessons. Even in Kagoshima, these classes on Chiran and kamikaze pilots have only started recently as Chiran has grown in fame over the past couple of decades. Interestingly, in comparison to the Army Air Base at Chiran, about twice as many kamikaze pilots took off from Kanoya Naval Air Base, also located in Kagoshima. However, this book barely mentions Kanoya, which reflects the much greater promotional efforts of Chiran that have resulted in the town becoming better known than Kanoya for kamikaze. Returning as a firefly was interesting. I cried a little, but this class was interesting. There were times there were tears in my eyes. I was sad. I almost cried. It was sad. It was sad. It would be scary if there were a war now. The story about kamikaze pilots was sad. It was sad that the planes exploded. When people went to war, it was sad. When there is a war, it's sad that everyone dies. It's bad if a person dies. It was sad. If there were war now, I would want it to stop. I thought it was great that Tome told everyone about the war even after the war ended. What would have happened if I had lived then?